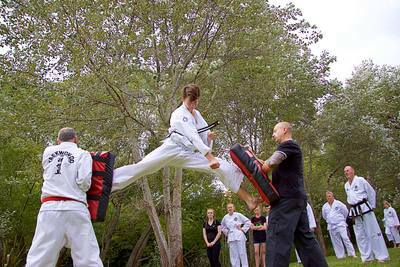 Taekwon-Do is an activity where you are challenged by your current physical ability. If you're just getting started then you will find it hard, but our seniors and instructors find it hard also because they push themselves to their limits. All classes are done as a group, nobody is left behind - this is really important, especially for those getting started. Your body is made up of a number of hinges (e.g. knees, elbows), sockets (e.g. hips, shoulders) and has a number of attacking or striking points (fingertips, fist, palm, elbow point, knees, heels, ball of foot etc.). In Taekwon-Do you will learn how the body works and how you can use it to your advantage, and in self defence you will learn how to use your opponent's body to your advantage. There are lots of kicks and punches in Taekwon-Do - during your training you will gain an exact understanding of your physical dimensions. After sufficient training you will know exactly how far away from an opponent you need to be so that your full power punch finishes just shy of their face. This is really important because by knowing that you will then be able to use your body effectively in both competition and in self defence. Self defence is the most underrated part of Taekwon-Do - we have a full and comprehensive syllabus which starts right down in the mini-kid classes and works all the way up into the main class. Our syllabus is reviewed and refined by our national and international leaders and is set at a realistic level and covers everything from avoidance through to legal obligations. Taekwon-Do is rooted in physics - basically power = mass × acceleration - we study the "theory of power" and seek every advantage to generate maximum power for activities such as board breaking. This involves breath control, sine wave (upward/downward movement), momentum, understanding the importance of relaxing at the right time, and tensing at the right time. These and more combined are a formidable force that can make breaking multiple boards look effortless. For many Taekwon-Do is seen as a physical activity, however we pay homage to the roots of our art, using Korean terminology in class (counting, naming stances, blocks, attacks, directions). Each pattern represents a notable figure in the history of Korea, and the study of these reveals a rich and fascinating history dating back to before 2,000BC. By training with Korean terms we ensure that any student will find it easy to travel internationally, as all clubs use Korean terminology in their classes, worldwide. 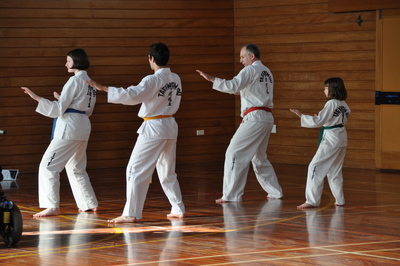 We are an ITF Taekwon-Do club in Mosgiel. We are led by Mr. Dion Bennett, 2nd dan and we train on Monday and Wednesday evenings and have extra activities throughout the year. Membership is open to anyone over the age of six and your membership allows you to train with any other ITF club world-wide. Not sure if Taekwon-Do is right for you? Keep reading - you are also welcome to come along to the club and observe or try for free for one month, no strings attached. Find out more. 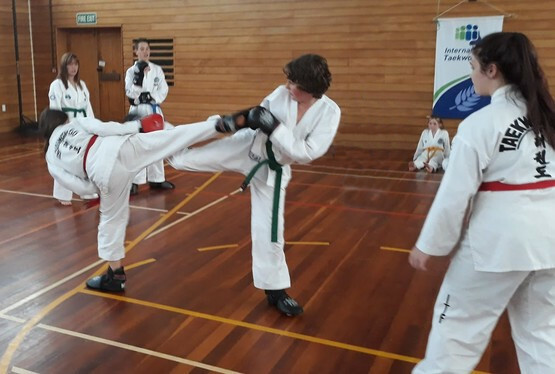 Taekwon-Do has many physical and mental health benefits, and promotes both personal achievement and working with others - see if it's right for you. Whether you're seven or seventy Taekwon-Do has something to offer. We pride ourselves on serving a wide range of age groups and abilities. 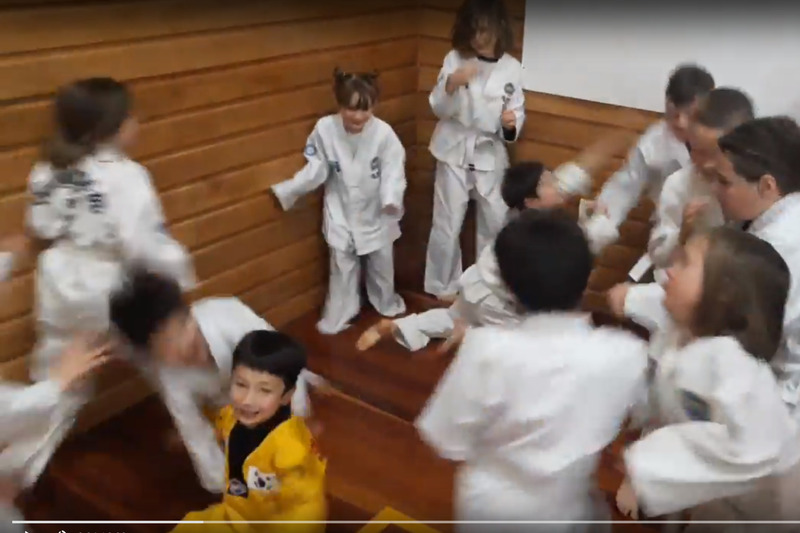 Starting Taekwon-Do is the biggest hurdle, but not for our kids - we have a good group of kids who love to work and play together to learn about Taekwon-Do.